Like in other areas of Thailand, pickup trucks loaded with young people and a barrel or two of clean water drive around the city. 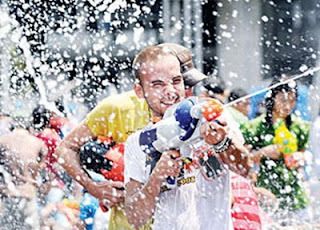 Armed with water guns, buckets, or any vessel that can hold water, these people go hunting down willing victims to soak. 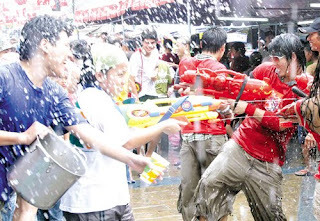 In another scene: Groups of people (all wet) stand in front of open shops, or just beside the road, armed with water pistols and large barrels of water wait for passersby. Of course, some people will try to avoid a likely ambush, but as quickly as they move out, a pickup truck-riding gang will drive by out of nowhere, and douse them with cool water. Anywhere, the objective is to get as many people possible to drench. 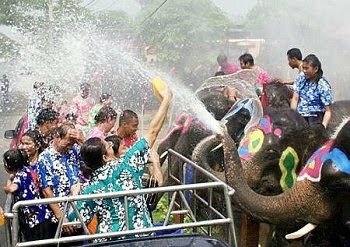 It's chaos, but absolutely an extreme fun that lasts three days - or even longer in other parts of Thailand. The cultural values of Songkran are expressed through the various ceremonies and rituals. And the meaningful aspects of Songkran are varied and rich in tradition. The first is Thanksgiving, a demonstration of gratitude to individuals who have done good, or have shown goodwill and are worthy of respect and recognition. Thanksgiving is demonstrated in the bathing of Buddha statues with lustral water and the pouring of lustral water over the hands of elders and respected individuals, as well as other outward demonstration of respect. The second cultural value is loyalty to ancestors, which is achieved through merit-making. The third focuses on the individual's sense of awareness of his/her responsibilities towards the family and home. It is demonstrated through the traditional ceremony of spring cleaning. The fourth value addresses the importance of religion and highlights the well-defined roles and responsibilities of the temples and monasteries on the one hand and the community served by the religious institution on the other.